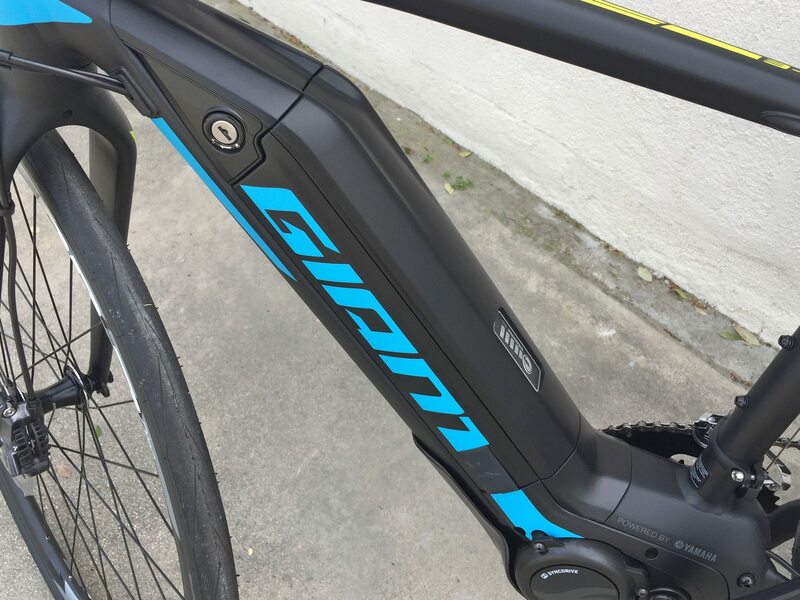 The Giant Road-E+ is a unique electric bike because it’s designed for performance. 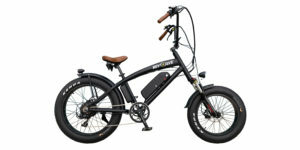 In the US, the ebike space has traditionally been dominated by commuter products with some cruisers sprinkled in for recreational riders that want to feel young and avoid overheating or struggling to keep up with friends and spouses. 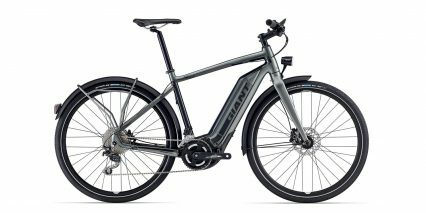 The Road-E+ by contrast is aggressive and sporty… Rather than limiting you to 20 mph like the majority of e-bikes, it delivers up to 28 mph assisted top speed making it a Class 3 product (not permissible on many trails and some paths in California and other states). 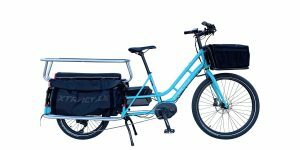 This is an electric bike that fits perfectly on the shoulder of the road and can help you earn the respect of cars starting off the line and ascending hills. 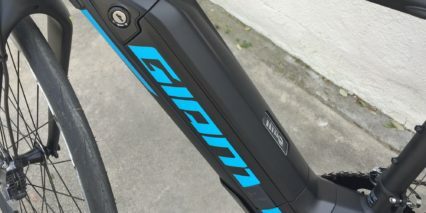 I was thrilled to give it a spin for this review because I love road bikes and know that Giant has a great reputation for quality at value price points. 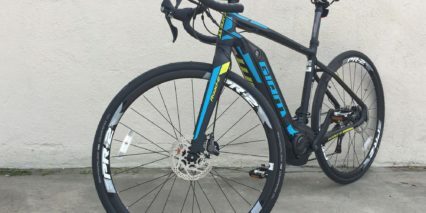 My takeaway is that it would ease some of the knee pain I experience on longer rides with lots of climbing, allow me to jump into more dynamic rides on the weekends even though I cannot train as frequently as my friend (and am thus in limited shap by comparison) and offer a good alternative to my non-electric road bike when my muscles need a break. Some of the challenges I experienced were the heavier footprint at ~44 lbs, stiffer all-Aluminum frame and limited motor RPM range. 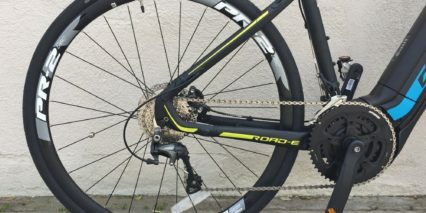 I have tested and reviewed other electric road bikes with drop bars and the Road-E+ is well priced by comparison but it’s still not cheap. 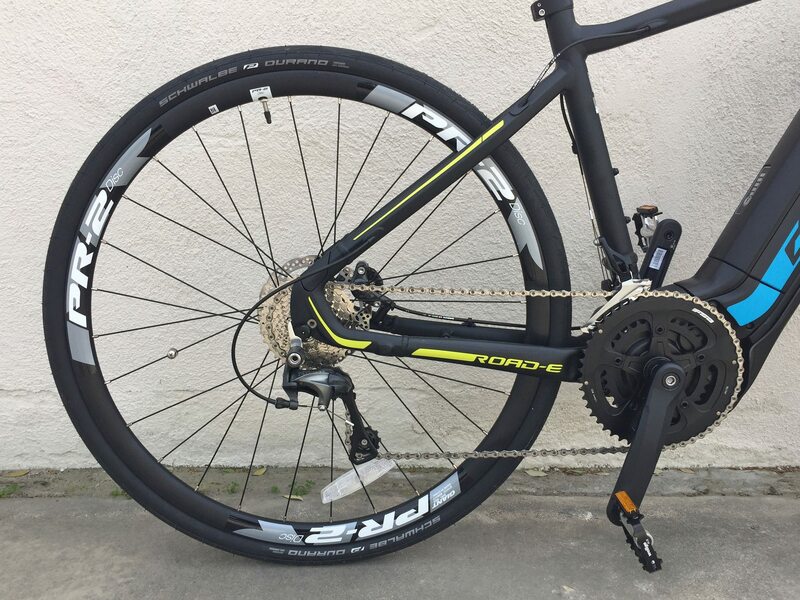 At $4k you’re getting decent components (Shimano Ultegra and 105) with a 22 speed drivetrain (many others are 1×10 or 1×11) and I love that there’s a vast network of dealers selling and servicing them, helping to honor the two-year comprehensive warranty on offer. 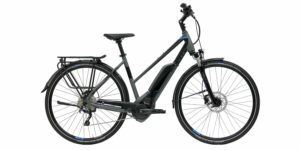 Driving the bike is a 250 watt nominal, 500 watt peak mid drive motor from Yamaha. Those numbers aren’t as important as torque in my opinion and the SyncDrive offers 80 Newton meters… which is a lot. 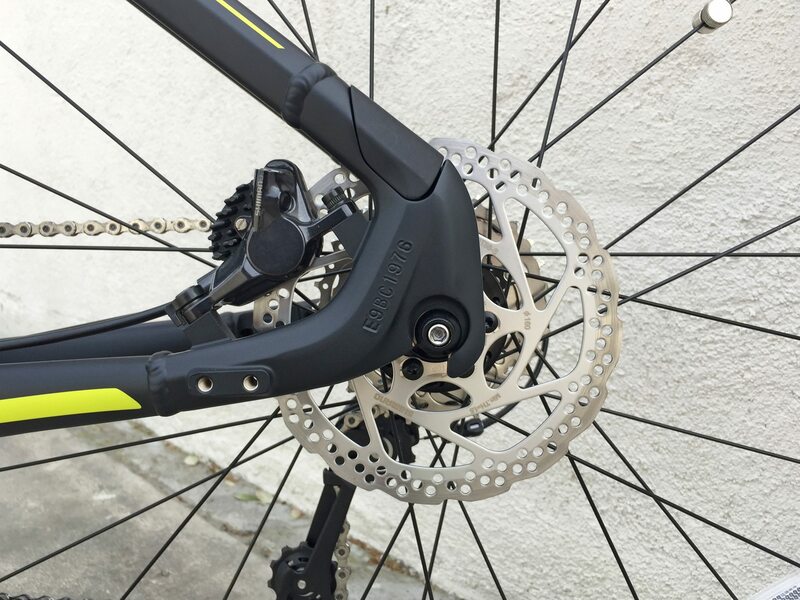 Bosch’s mid-drive, by comparison, offers 63 to 75 Nm and is not compatible with multiple front chainrings. The Yamaha motor is quiet and smooth but doesn’t quit spinning as quickly as Bosch. It measures the same wheel speed, pedal cadence and pedal torque signals and allows you to shift gears smoothly if you ease off a bit before pressing the paddles. 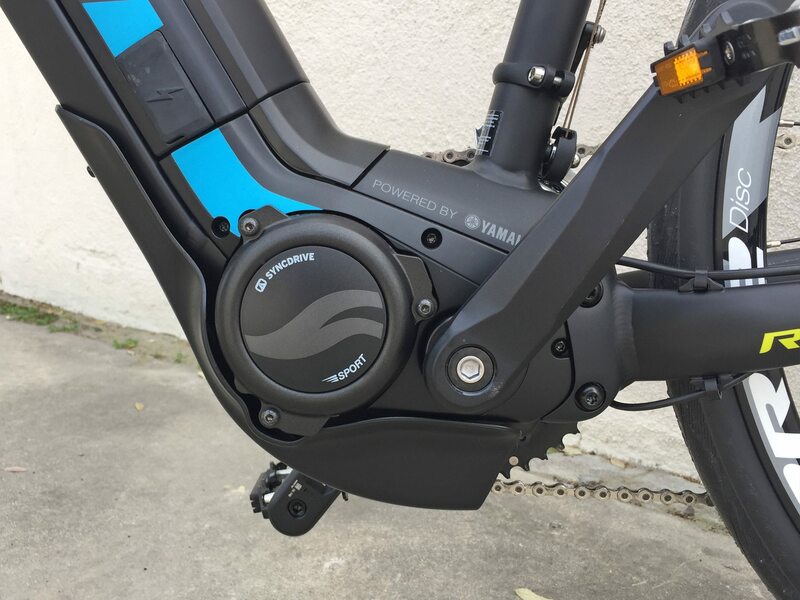 I love how integrated the motor is at the bottom bracket, how nicely it fits into the purpose-built frame and that it keeps weight low and centered as opposed to a hub motor system (popular with lower-end ebikes). One of the biggest benefits you get from a mid-motor is normal wheels and hubs that are easier to service and remove for transport or flat fixes. In addition to some plastic and frame surrounds, the motor also has a skid plate on the bottom that’s designed to protect it. 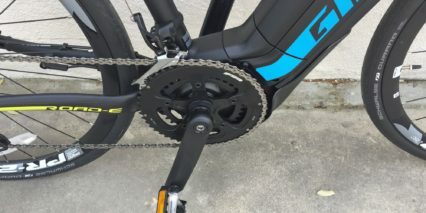 Notice that the chainrings hang down lower than the motor and would take damage before it would in most cases. The only big compromise I experienced with this drive system is a limited RPM output that requires frequent shifting to hit higher top speeds and sometimes leaves me wanting to spin faster before shifting. The problem with this scenario is that if I want to spin faster I end up doing it all on my own (and pushing more weight plus the normal wind and wheel friction). It’s difficult to raise the speed of the bike all by yourself and when the motor isn’t able to keep up you simply have to shift gears to go faster. For many people, the bike is simply amazing and works flawlessly but this is one area that I sometimes struggle with on the Yamaha motor compared with Bosch and it’s why I love that you can go to a shop and take a test ride before buying. Operating the Giant Road-E+ is pretty easy. Just mount the charged battery (I love that it clicks in without the key being necessary) then press the power button on the control pad. The display comes to life showing a precise charge level infographic and there’s even a percentage readout AND dynamic range estimate. Depending on the level of assist you arrow up or down to, the range estimate will change. It’s great to have this kind of feedback at your fingertips vs. guessing so that you can plan your ride for maxiumum fun. 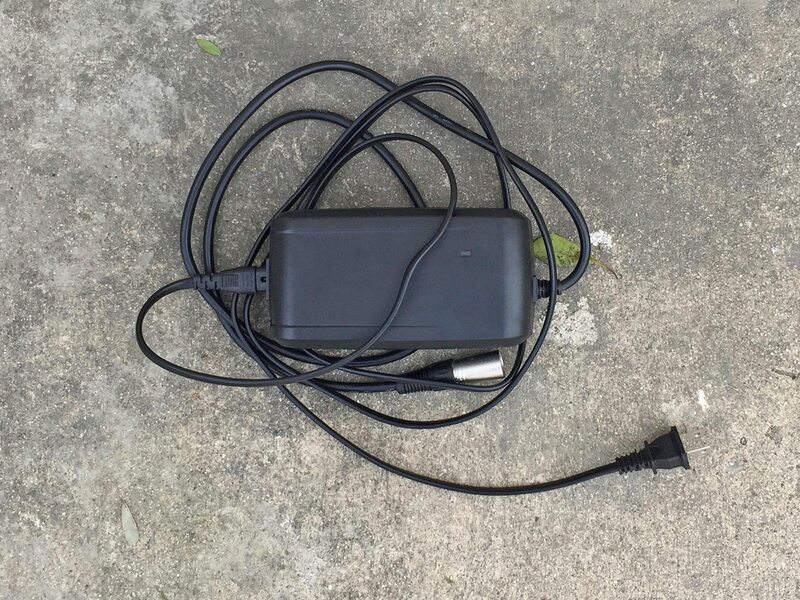 On this note, please make sure you always check your tire pressure because as with traditional road bikes, the narrower tires here can get snake-bite punctures easily if you hit a curb or let the PSI drop too low. This is a heavier bike after all and unlike many other e-bikes, the tires are narrow. So anyway, the display offers three levels of assist to choose from and gives you access to trip stats like range, trip distance, speed and max speed. 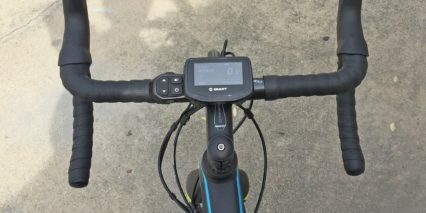 If you’re someone who likes to use Strava on your phone or use a Garmin device, you can do this easily with the Giant Road-E+ without having to run the juice down because there’s a little Micro-USB port on the left side of the display. One area of concern or question is where and how to mount your device given the already large LCD display. Also, the display is not removable so parking and storing the bike could present more opportunities for scratches which is a bummer. 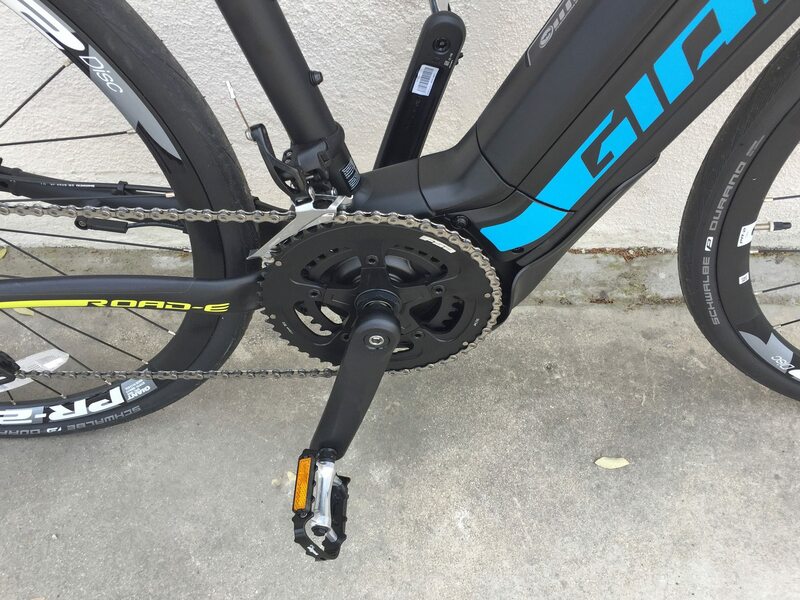 Consider putting a towel over… This and many other parts of the bike are smart and modular so if they are broken or lost, your Giant dealer should be able to help with a fix. 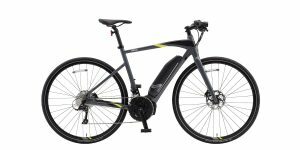 At the end of the day, there are only a few choices when it comes to electric road bikes and of course, you’d want a speed pedelec with drop bars. Beyond that, the four frame sizes, dealer network and beautiful integration seen here really impressed me. 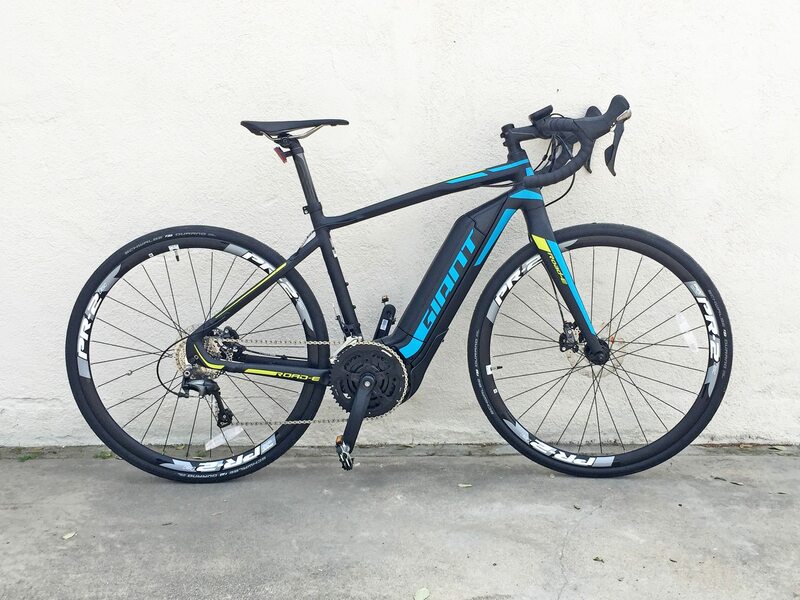 For $4k I feel like you get a lot of value and could have a blast with this bike. I love that in addition to bottle cage bosses, they added threaded eyelets and a mounting provision at the rear for a kickstand and some mounts for fenders. There’s no rack mount but this really isn’t a commuter setup… frankly, I’m not sure how well fenders would really work but the holes are there. 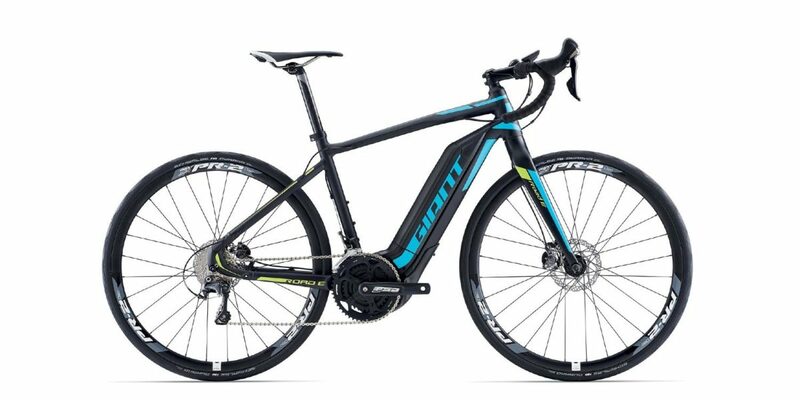 Giant sells a wider range of electric assist bikes in Europe and it’s wonderful to finally see them in the US. This is a refined product, despite being “new” to this market and I could tell that they had ironed out a lot of the kinks and compromises that other systems had not when they first arrived. 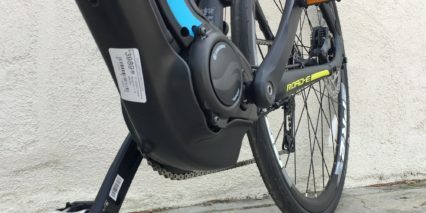 This thing uses a smart, reliable drive system that can work with you to achieve new types of rides and because it’s from a bigger more recognized brand, I feel like it might garner more respect as well (at least in the USA where ebikes are still catching on). 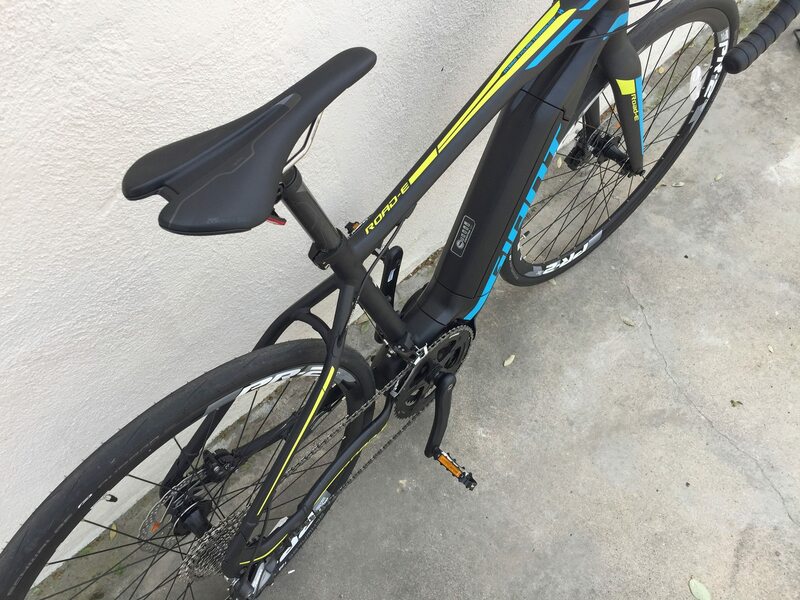 Because the frame is all Aluminum (including the rigid fork), one thing I would consider is a seat post suspension from BodyFloat. 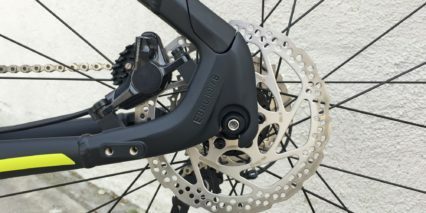 Their systems tend to be highly responsive, offered in lighte-weight materials like Carbon fiber and Titanium and are adjustable to rider weight. 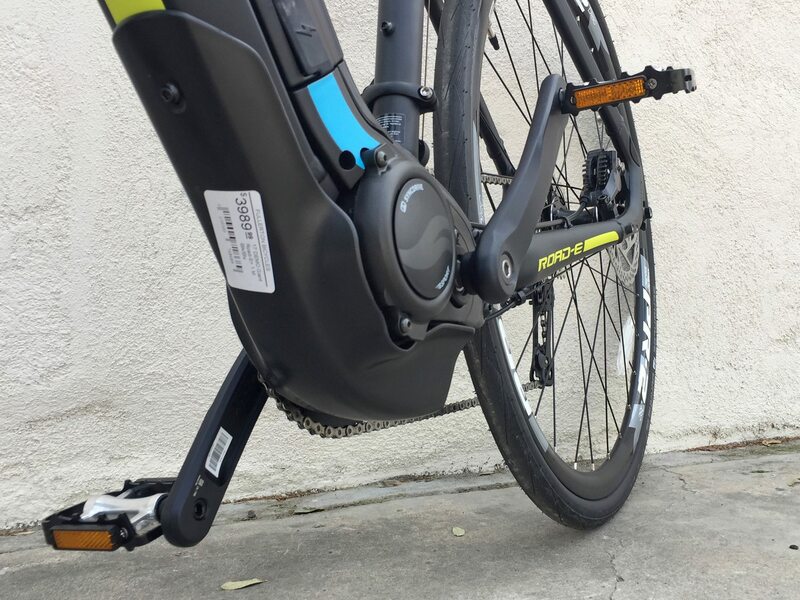 You might also benefit from a suspension stem like the ShockStop. 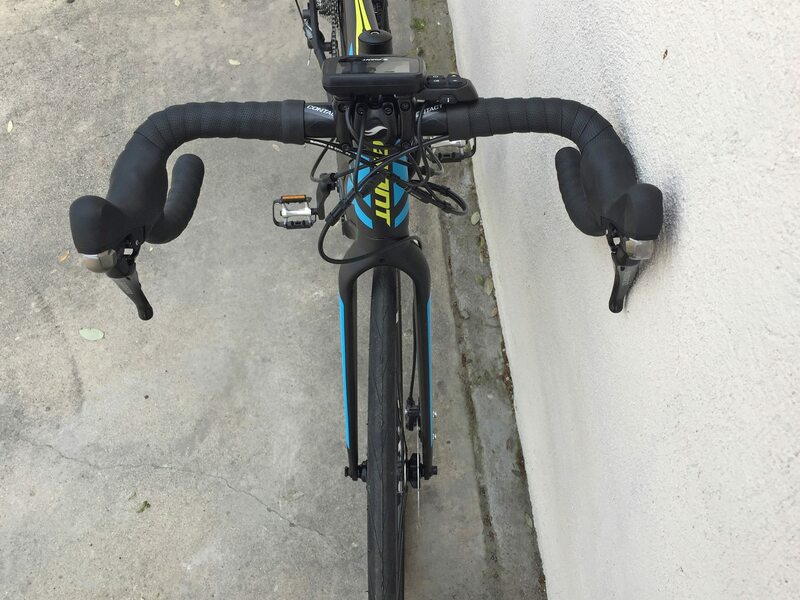 As someone with a crowded space and rented walls… I appreciate that there are threaded eyelets on the left chainstay for adding a kickstand! 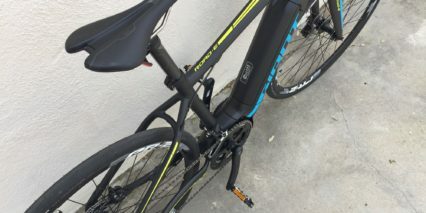 Given the all-Aluminum frame and fork, there’s not a lot of foregiveness going over bumps (especially at high speed), people tend to ride ebikes further and at higher average speeds so I’d consider using a Thudbuster or BodyFloat suspension seat post (look for 30.9 mm diameter) and maybe even a suspension stem, perhaps future Road-E+ models will offer a Carbon fiber fork? Nice bike, but handling that battery is going to be an issue. 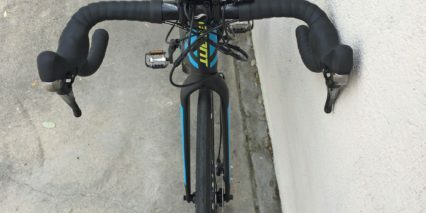 Even with the handle on my Haibike’s battery, I’ve found that it’s easy to muck up the stick-on graphics. With the Giant battery you’re pretty much forced to grab it right where the decals are. Good point Joe, I hadn’t thought as much about sticker placement and fingerprints, thanks for the feedback! 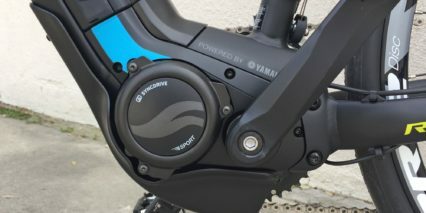 The Yamaha motor on my Haibike Sduro Trekking has that slight over-rev feature, too. FYI, I found that stopping pedaling was too disruptive to my rhythm, so I’ve gone back to the standard practice of slightly backing off pedal pressure for shifts. I suppose this could wear out my chain faster, but I’ll take the cost hit for it. Hi Soren, in my experience the Yamaha motor used on the bike reviewed here and some other Haibikes has a 100 RPM limit vs. Bosch and Brose which reach 120 RPM. 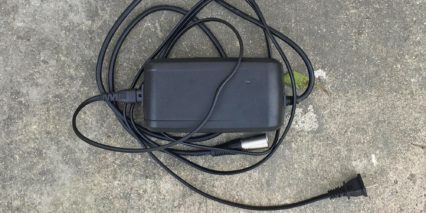 So in practice, that means that when you are spinning and reach a certain pedal rotation speed, the motor sort of eases back and won’t help anymore… so you can either work harder on your own if you prefer higher RPM riding or you can switch to a lower gear which will slow your RPM but allow the motor to help out again. 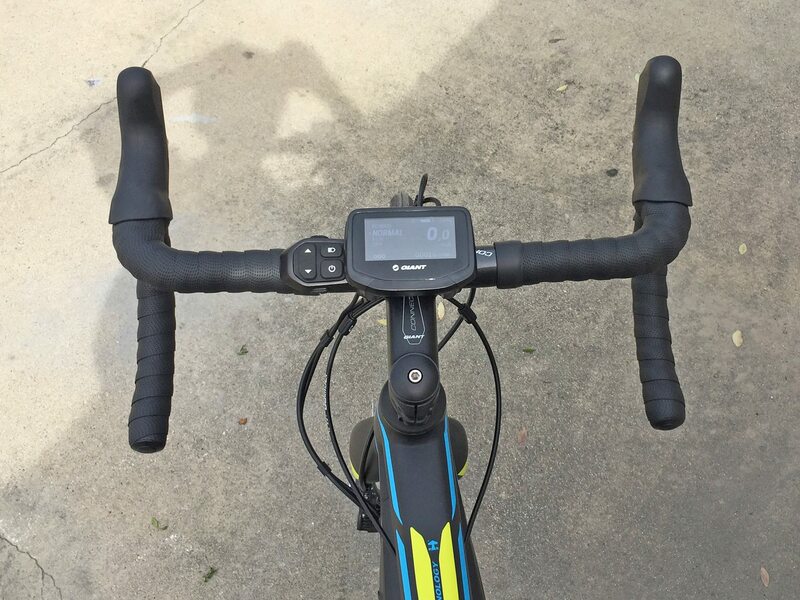 In practice, at least for me, this results in more frequent shifting and a ride style that is less enjoyable… because I like to spin due to a sensitive knee and a desire for a faster “cardio” type ride vs. slow and powerful. Does that make sense? Thanks for your comprehensive answer. That does indeed make a lot of sense. 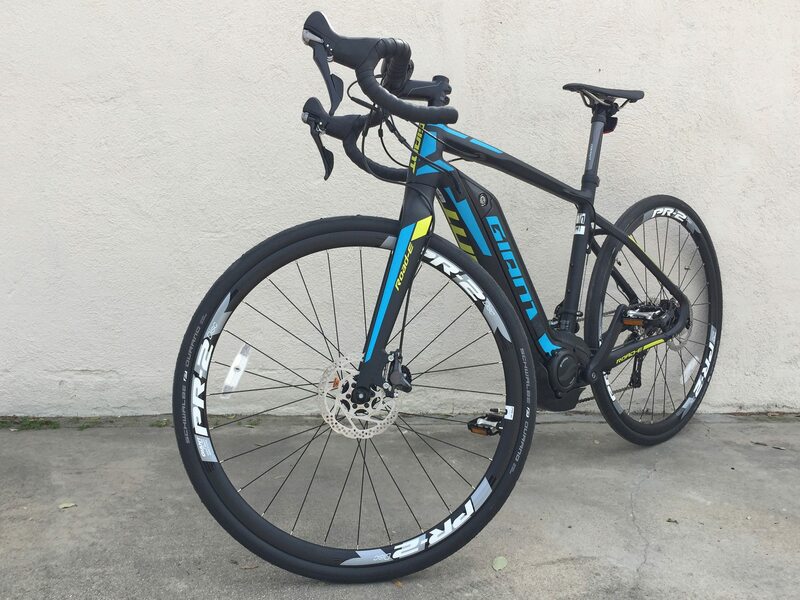 Just got this bike and rode two straight days at Horsey Hundred on the rolling hills around Lexington KY. Am about 185 lbs. Did 61 miles and 3,000 ft of climbing, and averaged 17 mph for rise. Still had 24% battery life left. Second day was nearly the same. Very natural feel and quiet. NOTE- the small frame does not have frame mounts for bottle. 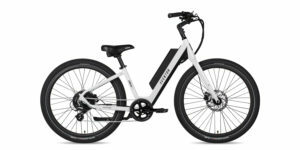 Hi Court, since this was a road e-bike review I thought I would see if you are going to have the opportunity to review the 2018 /2019 line of road e-bikes. 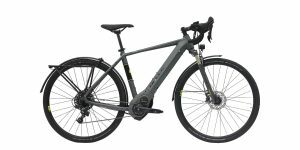 This seems to be a strong trend including the Bianchi Aria e-Road and Orbea Gain using the EBikemotion X35 system. This is the same system as the Desiknio you reviewed. didn’t the IGo road bike that you talked about on one of your trade show videos had the X35. Or the Pinarello Nytro and similar that use the Fazua system. I believe I read that Pinarello also has or is replacing the Nytro with the Dyado (?) that uses the X35. 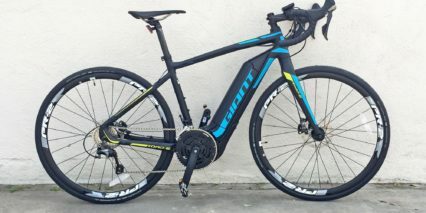 There seems to be a lot of controversy with these bikes because they are on the edge of that red line separating the road bike purists from the masses. Just as the MTB crowd resolved their issues I believe the road contingent will see the value in a little assist for those longer rides or that last ascent. 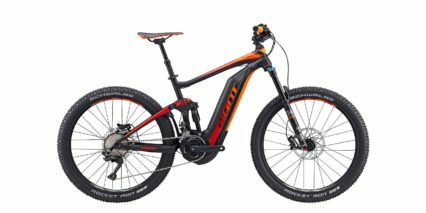 It would be great to get your feedback and opinion on these new bikes and there viability in the e-bike market. 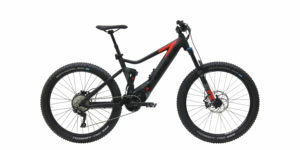 Along with the ever growing number of e-bike devotees, we at Hilltopper Electric Bike Company appreciate your enthusiasm and in-depth coverage of the e-bike market, and look forward to sharing our products and experience in 2019. Have a Happy Holidays from all of us at Hilltopper!